The Socket SD Scan Card 3M has been discontinued. No direct replacement is available. 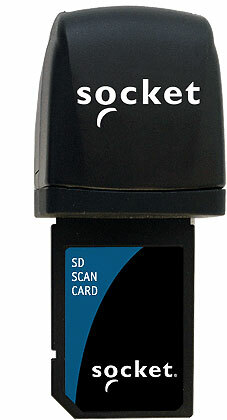 Socket's SD Scan Card 3M is a miniature barcode scanner integrated with an SDIO plug-in card. It is only 32 mm long and weighs only 8 grams. SD Scan Card 3M turns your Palm PDA or Pocket PC into a high-performance mobile barcode scanner. SD Scan Card 3M features the smallest Class 1 laser barcode scanning engine available today, ideal for large volume and high-speed scanning. It can automatically decode the most popular barcode symbologie, inlcuding UPC, EAN, Code 39, Code 128, Interleaved 2 of 5, Code 93 and more. It is also designed with battery-friendly technology to use minimal power for hours of operation without recharging.